BRegs Weekly edition is out now. The 14th edition of our e-zine gathers all recent social media discussions relating to SI.9 and the current review into one weekly digest. It is published every Friday lunchtime and gives a round-up of news highlights for the week. The Bregs Blog has published a series of public and stakeholder submissions sent to the Department of the Environment as part of the current annual review of BC(A)R SI.9. More to follow in the coming weeks. 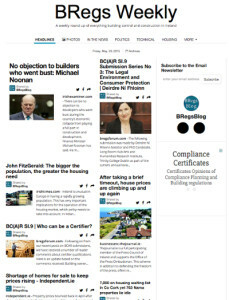 We recommend signing up for an automatic subscription to keep up with the discussion surrounding the current annual review of the BC(A)R SI.9, and more recent media articles and stories about building control and the impact of the regulations on the consumer and construction industry. This entry was posted in Building Regulations on May 29, 2015 by BRegs Admin.